We’ve all had survey experiences we’d rather forget. And the bad news is, because there are so many ways in which a well-intentioned survey can go wrong, the odds are very high that your company is still putting customers through bad experiences. 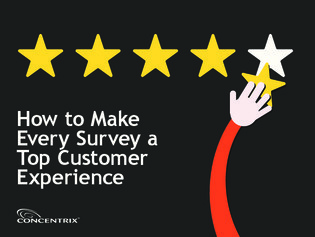 Surveys are an important part of your customer experience, which means they require the same level of strategy, planning, design, and management that you apply to your most important customer journeys and interactions. In this white paper, explore 4 key elements of a brand-building survey program. When you put the 4 pieces in place, your surveys can become powerful experiences that deepen – rather than damage – your customer’s relationship with your brand.